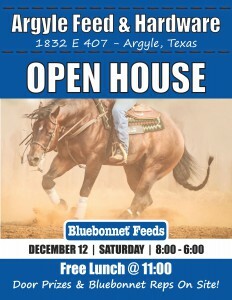 Visit Argyle Feed & Hardware on Saturday, December 12th for an Open House with Bluebonnet Feeds. Christine Warzecha, Bluebonnet Feed Equine Product Rep, will be here all day to answer your questions about Bluebonnet horse feed products and provide free feed samples for you to take home. Also, register to win door prizes all day and enjoy lunch on us on the porch from 11am to 3pm! Argyle Feed & Hardware offers Bluebonnet Feeds’ equine and poultry feed products. These superior quality feed formulations ensure the nutritional health and performance of animals to put them at the top of their class. 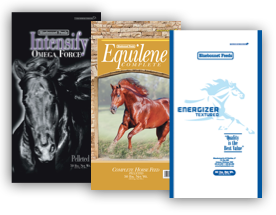 Go here to learn more about Bluebonnet Equine Feeds at Argyle Feed. 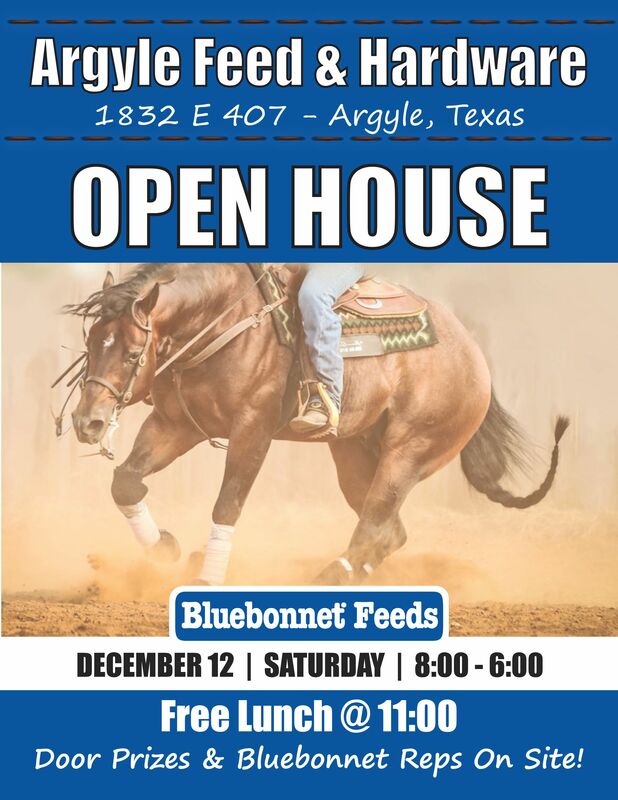 Visit us at Argyle Feed & Hardware this Saturday from 8 am to 6 pm to learn more about the benefits of feeding Bluebonnet Feeds to your horses. We are your Denton County destination for all of your horse, poultry and livestock needs. This entry was posted on Monday, December 7th, 2015 at 10:01 pm	and is filed under Events, Horse, News & Updates. You can follow any responses to this entry through the RSS 2.0 feed. Both comments and pings are currently closed.